If you would like more information please fill out this form. You will be contacted as soon as possible. Please complete all required fields . Adress : 2 rue Kellermann - 59100 Roubaix - France. 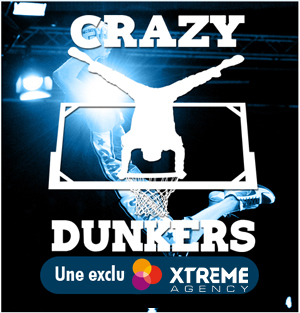 All the elements (texts, logos, images, sound elements, software, icons, layout, database) contained in the site www.crazydunkers.fr / .com are protected by the national and international law of the intellectual property. These elements remain the exclusive property of Crazy Dunkers and/or their partners. Any use, reproduction, representation or partial or total broadcasting of these elements is strictly forbidden except in particular for reproductions without modifications nor changes made for personal and private copy according to the article L.122-5.2 of the code of the intellectual property. Documents presented on the site are supplied "as is" and without any express or tacit guarantee; the website can present technical and typographic errors or other inaccuracies, what you recognize and accept by using the website. Crazy Dunkers could not be held responsible of the errors or the omissions presented by the Site or by any referenced document. The information contained in the Site is non-contractual and subject to modification without advance notice. In no circumstance, Crazy Dunkers will be responsible for fortuitous, direct or indirect damages, resulting from the use of the elements of the site, in case of contamination of the computer hardware of the Internet users resulting from the distribution of a virus or other computing infections. As user of the site, it is up to you to take all the measures suited so as to protect your own data and/or software of the contamination by possible viruses circulating on the Internet network. On no account, Crazy Dunkers, either third parties mentioned in their site can be responsible, in conformance with an action in contractual liability, in tortious liability or of any other action, any direct or indirect, incidental or secondary damage, or of whatever nature or any damage, in particular financial or commercial nature, resulting from the use of the site or of any obtained information about the site. The information, collected through the contact forms, is the object of an IT processing intended only for the company Xtreme Prod. The information collected through our Web site will not be transmitted to third companies. According to the French law " IT and liberties " of January 6th, 1978, you benefit from a right of access and from a rectification to the information which concern you. If you wish to exercise this right and to obtain communication of the information concerning you, please send to Crazy Dunkers by email or mail. When you visit the site, Crazy Dunkers and/or their partners can store information in your computer. This information will take the shape of "Cookie" or similar file. "Cookies" are data sent via your server on the hard disk of your computer which contain no personal information. The role of cookies is in particular to identify you during your connection on the Site and to facilitate your participation with certain events and activities on the Site. Crazy Dunkers saves their selves the possibility of implanting a "Cookie" in the computer of every Internet user visiting the Site to register any information relative to the navigation of its computer on the Site to be known, and without this list is restrictive, any information relative to the consulted pages and to the dates and times of consultation. "Cookies" cannot be used to read information contained in the files of your computer. Most of the Internet browsers allow you to eliminate the "Cookies" of your hard disk, to block all the cookies or to receive a message of warning before a "Cookie" is copied. Look at the instructions of your browser or in the help screen to know more about these functions. In the hypothesis where you choose to refuse the reception of cookies on the hard disk of your computer, the functioning of the Site will not be optimal from your terminal. You have to keep in mind that, in a general way, every time you supply voluntarily on-line personal information, this information can be collected and used by third parties. Therefore, you recognize that Crazy Dunkers cannot, on no account, be held responsible of messages exchanged by means of the communications tools which he offers to his users and possible consequences.